Surely the definition of 'no frills' value for money? Look up 'no frills' in the dictionary, and you'll probably find a picture of a Goodmans TV. For years the manufacturer has led the way in producing stripped down (but decent) TVs at eye-catchingly low prices. 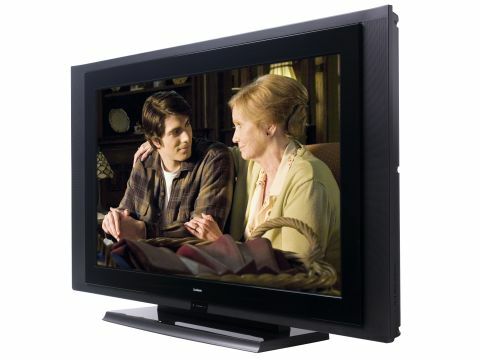 We're hoping that Goodmans will manage that again with its latest 32in TV, the LD3260HDVT, yours for just £500. In terms of design, this Goodmans TV manages a bit of gloss on the screen frame, but it still manages to look a bit cheap and cheerful. Connections are adequate, and include an HDMI input, component video input, PC jack, and compatibility with all the main HD formats bar (inevitably) 1080p. More than one HDMI would have been nice - but hardly expected for £500. Features beyond the HD Ready status are topped by a built-in digital tuner, which is Top Up TV compatible and supports the Freeview seven-day Electronic Programme Guide. There's also a Film mode for enhancing motion during movie viewing, a noise reduction system, and an optional 3D comb filter. Inevitably, the LD3260HDVT's performance isn't exactly world beating, but it's nothing like a horror show either. With our test disc of Superman Returns, right away the picture strikes you as bright and colourful, leaving Superman's fancy outfit looking vividly saturated. It's also surprisingly subtle in its colour blends and tones, helping Superman look anything but like a cartoon character. Distant shots of Metropolis, meanwhile, are delivered with solid detailing and clarity. It helps on the sharpness front, too, that action scenes like the rescue of the crashing plane are shown with only a modicum of resolution loss over moving image elements - certainly less than most ultra-budget sets. Black levels are respectable too, giving dark scenes a fair degree of scale and impact. That said, we're only talking about fair to middling black levels - they're not deep enough to challenge the best sets around. There's certainly some residual greyness around, and shadow detailing is only fair. Although the sharpness levels are good enough to show 'the HDness' of our Superman HD DVD, other TVs in this class look sharper still. And the LD3260HDVT's viewing angle is rather limited. Sonically, the LD3260HDVT is a decent enough performer. Dialogue sounds clean and authentic, and although there's a lack of bass during action scenes, the soundstage doesn't sound as harsh and cramped as it might. Goodmans has worked its budget magic again. You can get better performers and more features if you spend more. But, for £500, there's really nothing here you've any right to complain about.